The most highly anticipated time of the year for winemakers is almost here. 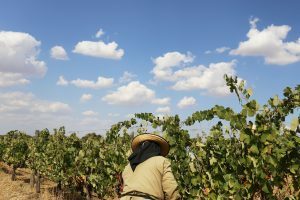 To celebrate, Herdade do Esporão (Alentejo) proposes a special Harvest Program, where anyone who would like to experience this time in Alentejo can participate. This year’s program includes several activities, like guided tours to the winery and cellars, wine tasting and a lunch prepared exclusively for this period. Herdade do Esporão welcomes participants to “experience the Alentejo” Harvest Program, between the 1st and 30th of September, on the Wine Tourism porch, by the vineyards, with a view of the Caridade dam, at 10am. This is followed by a walk through the vineyards and participation in the harvest, picking grapes in a relaxed atmosphere. Before lunch, there is still time for a visit to the cellars and the winery with a tasting of Esporão Colheita White 2017 and Esporão Colheita Red 2015. The lunch at the restaurant will be paired with 4 Esporão wines – Monte Velho White 2017, Esporão Private Selection White 2012, Esporão Reserva Red 2009 and Esporão Late Harvest 2017. The menu “5 Moments from the 2018 Harvest” includes two appetisers, a fish dish, a meat dish and dessert. 1.30pm – Lunch at the estate’s restaurant with 5 Moments Menu paired with 4 Esporão wines (Monte Velho White 2017, Esporão Private Selection White 2012, Esporão Reserva Red 2009 & Esporão Late Harvest 2017).